The grounding of Airbus A380 airplanes sporting Rolls Royce Trent 900 engines was certainly warranted following the in-flight disintegration of an engine on a Qantas flight from Singapore. 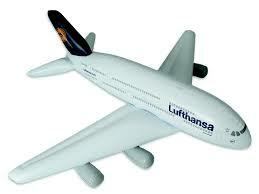 But what has made global news for more than a week now, also demonstrates a dramatic disparity in aviation safety. The Airbus near-disaster is being treated with tremendous respect. Yet, across the United States, another sector of the aviation industry is crashing aircraft at a rate equal to an airline disaster every day and unbelievably, this carnage is accepted as the cost of doing business. I'm talking about business of medical transport and the price paid by patients who are moved by air. Last week, Nanci Wilson of KXAN in Austin, Texas reported on the case of Oscar Vaz. His 12-year old daughter bumped her head at summer camp in June. Now that's not news; everyone knows that bumps, bruises and bug bites are part of the camp experience like campfires and ghost stories. Only in this case the camp called for an ambulance, and it wasn't the four-wheeled variety that showed up it was a helicopter. After a brief visit to the hospital, the girl was released back to camp with a clean bill of health and not long after that, Oscar Vaz received a bill for $16,000. Oscar is one smart daddy and he started to wonder just what motivated such a drastic response to a simple bump on the noggin. What factors led to the decision to bundle the child into a helicopter and on to Dell Children's Medical Center? Critical attention from a doctor couldn't have been the issue since the helicopter flew right past two hospitals located closer to the camp. And there was no stated need for some highly sophisticated medical technology only available at the medical center in Austin. Oscar was mystified. "If it is important enough to call an air ambulance, then why not go to the hospital that's 30 minutes away?" he asked me rhetorically when he called this summer. I didn't know Oscar then. He came across some of the many articles I've written on this subject when he started researching air ambulances. He got in touch because he was trying to understand the money machine that is today's for-profit air ambulance business. But Oscar didn't need much from me. He was already asking the right questions. When the bill arrived, Oscar asked why the 9-11 dispatchers called - then cancelled - Starflight, the Travis County public service helicopter, a taxpayer-supported service which would have cost considerably less, and instead dispatched the for-profit air ambulance Air Evac? If speed was the issue, why did it take the 90 minutes to get the child to the Austin hospital which is only a 50 minute drive from the camp? Surely, Oscar thought, there must be some standard operating procedure used for determining when an air ambulance is needed and when it is not especially considering that medical helicopters are themselves, not particularly safe. What Oscar didn't know - and if you ask me, it's a good thing for his peace of mind that he did not - is that the period of time in which his daughter was flown; the hours between 10 pm and 6 am or what's called "backside of the clock" are the most dangerous hours to fly by helicopter medivac. Nearly half of all the EMS helicopter crashes take place during this time and they are almost four times more likely to result in fatalities than helicopter accidents occurring during the day. So Oscar and his daughter had two things to be thankful for; No medical problems and no unhappy landing. 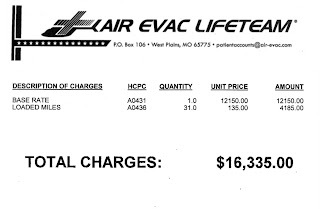 But there is that whopping bill from Air Evac. And I think that Oscar, and others who have been transported by air unnecessarily feel companies like Air Evac are playing them for fools. Their complaints, however, always get reduced to the argument that they are better-safe-than-sorry, that air transport is worth the cost because, after all, a life is on the line. This is the bread and butter scare tactic used by the helicopter ambulance industry and you don't have to go farther than the comment section on this blog to read the endless varieties on that theme. But one thing aviation does well is the cost benefit analysis and this better-safe-than-sorry argument doesn’t hold up to that scrutiny. So before Americans go any farther embracing the booming business of air ambulances, its critically important to analyze how the industry got cross-wise with safety and study the programs that seem to be doing things right. And with that I’ll leave you with the promise that these are the subjects I discussed recently with Dr. John Morris Jr., director of Vanderbilt's Lifeflight program, which will be featured in an upcoming post. What's even more disgusting is Air Evac operates the oldest junk aircraft in the industry. Most are around 30 years old, refurbished to their low standards, they are underpowered, and very very cheap to operate. They use 60's technology and charge state of the art rates. The fact they would charge 16k for a flight in one of those junk machines is criminal. Thats the reason why an SMS is essential, not only for the helicopter operators, but also for the para-medics and others in medical and related industries...you need to balance the hazards with its consequential related risks and then decide what course of action is the most prudent...there is no point going off the rocker using the word "Safety" as its misuse is more damaging than its non-use! Thats what the world needs to learn from the aviation SMS and adapt in daily operations albit with a name other than SMS if they dont want to be called caopy cats! This industry although may not have started that way, but it has evolved into it..and that is that it has become about the money and not about the patient.I am not saying that there is no place for the HEMS industry, but at then end of the day we need to look at the cost that is being paid by the people in the aircraft.As mentioned in the article, if the same rate of accidents was occurring in the commercial aviation industry, the entire commercial aviation industry would be stood down. Please post your pilot's certificate, EMS, nursing and/or MD certificate. Share with all of us your qualiffications on which you base your judgements. You remind me of those who say "I don't have any education in this field, but know what I'm talking about because I have common sense." That translates as; you aren't smart, you're just pretend smart. How does everyone assume that this child was treated by " highly trained ground EMS personnel" ? One poster has very negative things to say about AEL's Bell 206 Longrangers. Newer does not always equate to better and safer. The 206 is a rugged, proven aircraft. I've got a lot of hours in this airframe and I love it. It may not be as fast as some of the newer aircraft, but when talking of ranges of 30-50 miles, 15-20 mph doesn't make a huge difference. Check out the NTSB database, newer aircraft have their share of accidents. Also, what if this young lady was found unconcious in the shower, would that make a difference? Since EMS doesn't carry MRI machines, would you want them to take a chance with your child. If they erred, do you think Oscar would want to sue? Incidently, Marble Falls EMS are all Paramedics and some of the best in the business. I'm sure AEL doesn't question them when they're requested. As far as the Bell 206 -They are good aircraft -to a point. But what you fail to mention is that AEL uses twenty to thirty year old refurbished aircraft. I little more than "slightly used". If they were automobiles, most of the AEL fleet would qualify for antique plates. This is mainly in response to anonymous (November 18, 2010 5:41 PM) but also to a few of the others. I had an interesting weekend. Texas had its state EMS convention this weekend and I decided to present more details about my entire experience to the Air Medical and EMS committees. I was surprised that not one of the 100 or so people in the room came up to me and made the comments that the readers of this blog are making. I am not sure why. Maybe I gave them more information, or maybe the managers in the room realized that the system has faults and can use improvements. So in my case the cost would have been $6,035. A non resident would have paid $10,135. 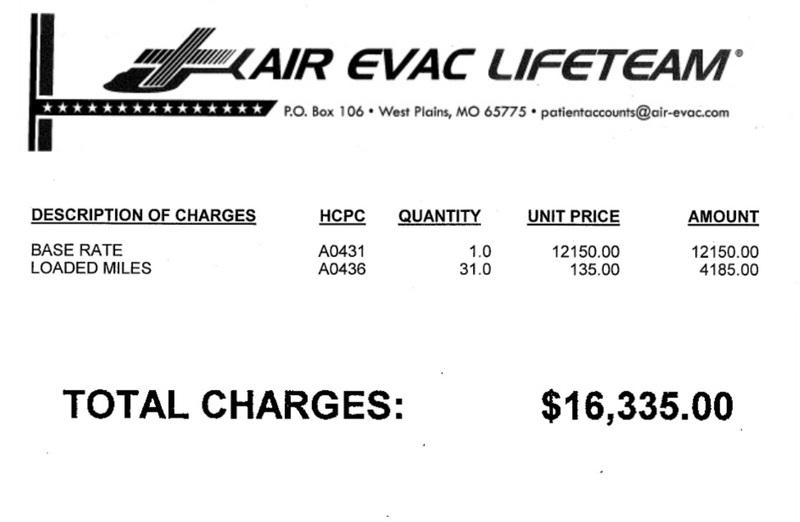 Quite a discount from the other providers charge of $16,335. You can argue local taxes cover some of the costs and I would say that the membership fees also represent a tax. Keep in mind that cost is only one part of the problem. The real question is when should air transport service be used by EMS. This is mainly in response to anonymous (November 18, 2010 5:41 PM). Now to correct the anonymous poster about charges for Austin's StarFlight under the same conditions. The charges are fixed and published by the County. Your lack of basic critical thinking is appauling and downright frigtening. You encapsulate everything that is wrong in our modern society with your elitist attitude and blatant disregard for facts and reasoning. I read your bio and I was truly frigtened that you have rose to the position that you hold and that you regularly spew this misinformation and biased bull to people who think you actually know what you're talking about. "His 12-year old daughter bumped her head..."